California law protects workers from wrongful termination, discrimination, harassment, and unlawful compensation practices among other things. 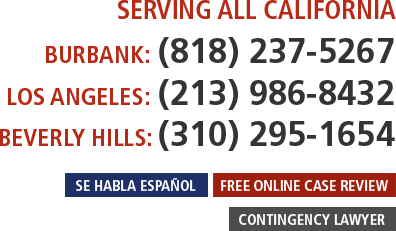 Los Angeles employment attorney Rosa Vigil-Gallenberg is well versed in the rights California workers have under the law, and she can fight to ensure that your rights are protected. Gallenberg PC does not charge prospective clients for an initial telephone intake with a member of our legal team and we accept cases on a contingency fee basis. Some employment claims have a short statute of limitations and therefore it is important to contact a labor attorney’s office as soon as possible to avoid losing a claim due to the passage of time. If you believe you’ve been a victim of an unlawful employment practice, submit your case for review to an employment lawyer by calling (818) 237-5267 (Burbank) or (213) 986-8432 (Los Angeles) or (310) 295-1654 (Beverly Hills) or by filling out a quick and easy free online Case Evaluation Form. We do not charge prospective clients for a confidential telephone intake or online case review. Wrongful Termination. We aggressively litigate lawsuits in California involving allegations of illegal firing, discrimination, violation of public policy, defamation, breach of contract, fraudulent inducement, conversion and similar claims. Overtime, Compensation, Meal & Rest Breaks. We have recovered millions of dollars for clients claiming overtime pay, meal and rest break violations. We handle claims of unpaid compensation, unpaid off-the-clock work time (i.e. e-mails, preparation), and misclassification of employees as exempt from overtime. Sexual Harassment. We protect the legal rights of victims of workplace sexual harassment. Discrimination and Harassment. We have experience assisting employees with claims involving discrimination or harassment of individuals because of race, religion, national origin, ancestry, physical disability, medical condition, genetic information, marital status, gender, age (over 40 years old), pregnancy, and sexual orientation. Retaliation Claims. We represent individuals who have been retaliated against by their employer after complaining about harassment, compensation, discrimination, and/or unsafe working conditions. Class Actions: We have settled multiple state and federal class actions involving allegations of employment/labor law violations, including wage/hour class actions. Unreimbursed Business Expenses. California law requires employers to reimburse employees for reasonable expenses incurred in connection with their employment. Some common unpaid business expenses are uniforms, mileage, and phone usage. We help employees recover their unreimbursed business expenses. Inadequate seating at work. Employees have a right to work in a place with adequate seating. We help employees whose employer fails to allow them to sit at work or makes seating unavailable. Medical Leaves. We help employees resolve claims against their employers for failure to provide medical leaves and/or discrimination because of a medical condition. Whistleblower Protections. Employers are prohibited from retaliating against a whistleblower because he/she reported the illegal activity to a government agency. Qui Tam Actions . In a qui tam case, the attorney can help the whistleblower bring a lawsuit on behalf of the government against the employer for damages incurred by the government caused by the employer’s fraud or illegal acts. Under the False Claims Act, for example, the “relator” or whistleblower is awarded 15-20% of all moneys recovered by the government. If you have a legal employment matter that is not otherwise noted on this page, we encourage you to contact us; an employment lawyer may be able to assist you. Workers in California do not leave their rights at the door when they go to work. Every employee is entitled to fair pay and a workplace free of discrimination and sexual harassment. A Los Angeles employment lawyer at Gallenberg PC is prepared to aggressively litigate your case to protect your best interests. You can fill out our short and easy online Case Evaluation Form to get your case screened by an employment attorney or you can call us. Our employment lawyers take cases on contingency fee basis and do not charge upfront fees to prospective clients for submitting their case for evaluation. If you need a Los Angeles Employment attorney to take your case on a contingency fee basis, submit your case for our consideration by dialing (213) 986-8432. For Beverly Hills, please call (310) 295-1654. If you need a contingency employment lawyer in Burbank and surrounding San Fernando Valley, please call (818) 237-5267 to be considered. We do not charge prospective clients for a confidential telephone intake or online case review.